(WOMENSENEWS)–When Lois Newland began working as a nanny in New York a few years ago, she was disappointed to learn how few rules there were about the type of treatment she could expect at work. Overtime, severance pay, personal days, maternity leave and wage standards were all left up to the discretion of an employer, with few federal guidelines on what household workers could otherwise expect on the job. “In the islands, we have protection for domestic workers, so I was very aware of my rights,” said Newland, who grew up in Jamaica and has worked as a nanny in New York City, Long Island and Connecticut. Jamaican law guarantees domestic workers employer-paid maternity-leave and legal recourse against employers who fail to pay. It also extends the weekly minimum wage of $51 to household workers. A year ago, Newland encountered other nannies in the playground distributing flyers about a campaign by Domestic Workers United, an umbrella advocacy group in New York. The group’s members include the Damayan Migrant Workers Association, which organizes Filipino domestic workers in New York and New Jersey, and Unity Housecleaners, a worker-run cooperative on Long Island. The fliers called for lobbying support for a New York state bill of rights that would extend some federal labor provisions to nannies and other caregivers who are privately employed. 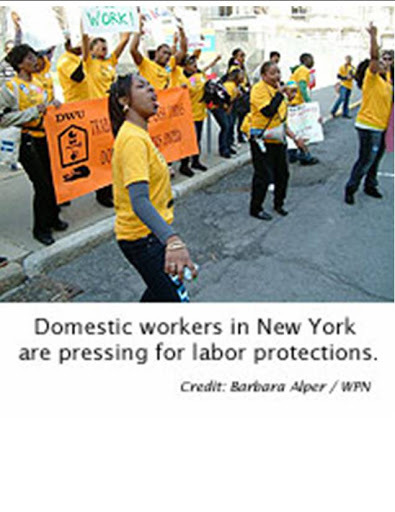 In 2003 Domestic Workers United successfully lobbied the New York City Council to pass legislation protecting the rights of domestic workers who used city employment agencies. It began working to reach all domestic workers throughout the state. For several years in a row the bill has been blocked in the state Senate Labor Committee, where members doubted it had any chance in the Republican-controlled chamber. This year, however, Benjamin Rosen, communications director for Assemblyman Keith L.T. Wright, a grandson of domestic workers who is sponsoring the bill and working closely with Domestic Workers United, thinks things are looking better for the bill this session. The Assembly Labor Committee passed the bill 25-1; it will proceed to the full Assembly, where it currently has 13 co-sponsors but needs 76 votes to pass, and to the Senate for consideration. Wright hopes that the bill will be voted on shortly, due to the high levels of stress domestic workers are facing from the recession. “We met with most of the new Senate leadership, and all of them said this is something they would support,” said Ai-Jen Poo, executive director of Domestic Workers United. Last year, some critics argued it was too sweeping and should be presented in a more piecemeal fashion. Others argued that domestic workers should seek an amendment to the federal National Labor Relations Act rather than working on the state level. The proposed bill of rights would amend New York’s labor law to mandate employers to provide health coverage for full-time employees or a wage supplement; advance notice of termination; paid sick days; cost-of-living pay increases based on the U.S. Consumer Price Index; and appropriate severance pay for long-term domestic workers. Currently, the National Labor Relations Act, also known as the Wagner Act of 1935, guarantees the rights of most workers to organize labor unions or collectively bargain but explicitly excludes domestic or agricultural workers. The Fair Labor Standards Act of 1938, which sets a national minimum wage and guarantees overtime for many jobs, excludes caregivers for children and the elderly, and prevents live-in domestic workers from receiving overtime. Other labor acts, such as the Occupational Safety and Health Act, also exclude domestic workers. The Damayan Migrant Workers Association estimates that white-collar households that earn above $100,000 a year and have small children employ at least one worker in their private households. There are about 200,000 domestic workers employed in New York state, according to research compiled between 2003 and 2004 by Domestic Workers United, the Brennan Center for Justice at New York University and the New York-based Jews for Racial and Economic Justice. Twenty-six percent earn wages below the poverty line or below minimum wage. Half of all domestic employees work overtime–often working 50 and 60 hours week–but only about 30 percent earn overtime pay. Nine out of 10 domestic workers do not receive health insurance from their employers, even though the work they do is often very physically demanding and may, in the case of housekeepers, expose them to toxic chemicals. In New York, according to the research, 95 percent of domestic workers are estimated to be people of color and 93 percent are women. Most are immigrants. Some domestic workers told the researchers about abuse at the hands of employers, who exploited their fears of deportation to withhold thousands of dollars in wages. Others verbally or physically abused nannies and housekeepers; some live-in workers reported being placed in basements that lacked heat during the winter. Rebecca Harshbarger is a reporter at Women’s eNews, based in New York City. Any thoughts and comments to share? If so, click on “comments” below. Hello, thanks so much for all your feedback on this article. I’m Rebecca Harshbarger, a freelancer for Women’s eNews. I found the advocacy organizations by searching for organizations that support domestic workers. I interviewed the lady who works for the au pair organization because she employs a domestic worker, is dealing with the effects of the recession, but is urging other mothers to treat their nannies with respect and not cut their wages. This article brings up some good points. From the comments, it doesn't seem fair to stereotype nanny agencies. There are several good nanny placement agencys that offer health insurance options to nannies and also encourage open communication. This is key.